The library has a variety of rooms available for reservations. We have two e-classrooms: the larger is equipped with 20 computers and the smaller (Library BI2) offers 10 computers. 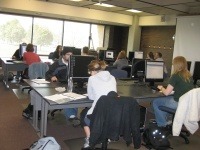 To reserve either lab for research instruction, contact your library liaison or Jeannie Peterson. We have three small group meeting rooms with large monitors and dual keyboards (great for small group projects); to inquire/reserve a computer meeting room, please contact library-reservations@gustavus.edu. The library also offers two audiovisual viewing rooms, located on the lower level; to reserve an AV viewing room, please contact library-reservations@gustavus.edu. For larger group meetings, we also have a 12-chair conference room available on the main floor (sans computer projection), please contact library-reservations@gustavus.edu. Please use the calendars below to check on availability. For general questions about room reservations, contact library-reservations@gustavus.edu. 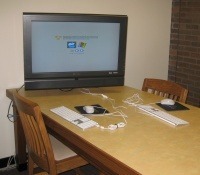 The library’s larger electronic classroom is primarily for library instruction and secondarily for public use by students; faculty may reserve this room for special occasions in consultation with the library chair. It is not available for classes that require frequent hands-on computer facilities throughout the semester. For those needs, please contact the Registrar or Gustavus Technology Services. To schedule an instruction session, please contact Barbara Fister. To schedule one of the library's e-classrooms, please contact library-reservations@gustavus.edu. To schedule an audiovisual viewing room, please contact library-reservations@gustavus.edu. To schedule either computer meeting rooms 202, 206 or 211, please contact library-reservations@gustavus.edu. To schedule one of the corner study rooms, please contact library-reservations@gustavus.edu. To schedule the library's conference room, please contact library-reservations@gustavus.edu.